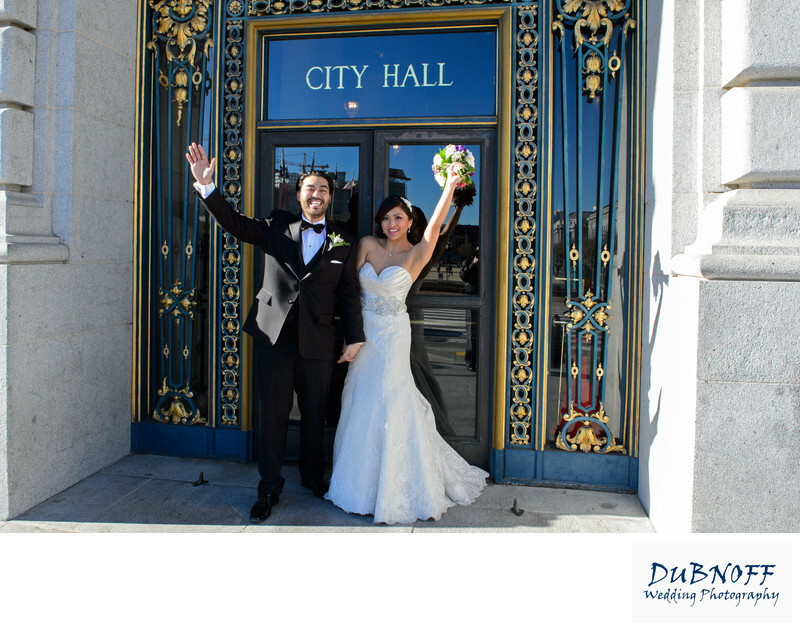 There is probably only one thing that ALL of our San Francisco city hall brides and grooms have in common: They all want a photo in front of the famous City Hall sign. So then the challenge becomes how do we make each shot different so our bride and groom feels like they have something special? Well, we have developed a number of poses and fun shots that we try to use depending upon the couple. Sometimes we have the couple walking out of the building and raising their fists. Other times it's just a wave. We have done jumping shots and yelling shots, you name it. For some couples, just a simple posed shot is enough. As you can see from the photo above, the front door to city hall is beautiful so you can see why newly married couples always want this shot. With this couple we had them wave and also did a nice posed photograph.